Beginning in 2019, SOMBA now has a new Director of Player / Coach Development, Aqil Samuel. This position will help to establish a standardized coaching approach across divisions within SOMBA. Aqil was the starting right fielder for the Prairie Baseball Academy (PBA) for 2 years and was on the very first PBA team in 94-95. He was named the first captain of the 95-96 team and was a career .397 hitter at the PBA. He went on to play NAIA for Viterbo College in Lacrosse, Wisconsin in 96-97 and was named a First Team All-Conference RF for a team that made it to their first ever Regional Tournament. In 97-98 Aqil came back to the University of Lethbridge to finish his Bachelor of Management and coached the first ever Junior Varsity team at the PBA. He stayed in the game after graduation, coaching for 5 years in the American Legion program in Medicine Hat and 5 years with the Sherwood Park Midget AAA team. Aqil was the Head Coach of Team Alberta that won gold in the Western Canada Summer Games in 2007 and he coached Team Alberta in 2 Canada Cups in 2008 and 2009. He has coached his son Aden for the last 8 years of minor baseball. 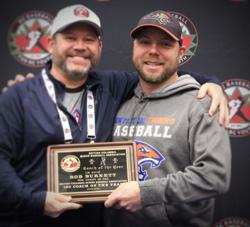 Coach Rob Burnett who was recently named 13U Coach of the Year for BC Minor Baseball Association at the 2019 BC Minor Coaches Conference in Langley. In addition to being an outstanding coach, Rob is also an important member of the local business community in Penticton, and owner of Freeride Boardshop on Main Street. South Okanagan Minor Baseball is very proud to have Rob as a coach and as a board member.